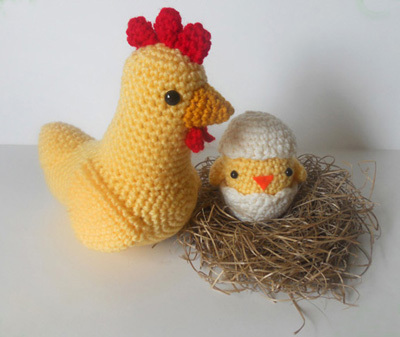 Easter is a great source of inspiration when it comes to crafting, and lately I have been busy making Spring related items, such as flowers, bunnies etc… And I just finished a mama chicken and her baby chick. I used raffia I found at the floral section of the craft store to make the nest. I learned a lot about chickens while making these amigurumi. I learned that the top of the head of a chicken is called a comb, and that the part underneath the beak is called a wattle. Thanks to crafting, I expanded my knowledge in bird anatomy! Next Easter fridgies, bunny and chick.